Yep, it’s the time of the year when America goes crazy and the rest of us watch forlornly as we’re “enticed” with crummy 10% offers on things we never wanted… Black Friday! No matter where you are in the world though, Habbo have an offer for you that might be worth getting out of bed for. This year for 180c+d you will get a duo of yeti masks, a quad of the new footprints, some trees and ice, 3 months of HC, a shiny badge, BUT also 80 credits cashback! This means that you are essentially getting all the goodies for 100c/180d, not too shabby I reckon. Time will tell how the yeti masks will fare in terms of value, but history tells us it could potentially be a big earner in the future – just don’t expect too much, as you do get 2 in a pack after all. 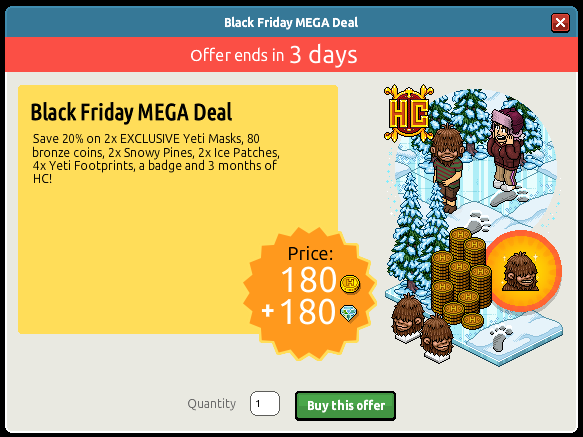 The offer is limited to 3 per Habbo, which will set you back 540 of your shiniest coins and diamonds should you choose to go for the maximum, and while this isn’t THE greastest offer of all time the added HC is certainly tasty and it’s far far better than any of the recent bundle “offers” that I can think of. What do you guys think? Are you going to be buying any of these packages? And will you sell or keep the new items? Let us know! 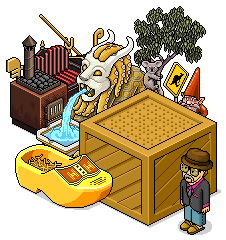 How much do you know about Habbo furni? Can you separate your rares from your norms? Know your dragon lamps from your dragon pets? Know the full rainbow of pods? Test your knowledge with our furni quiz, and share your results with us!